- Arby's - Fish Sandwiches are back along with new Nashville Hot Fish Sandwich. There's a two for $5 deal on either fish sandwich (details). - Boston Market - The Baked Cod meal is back and only available on Fridays (every day in Delaware). 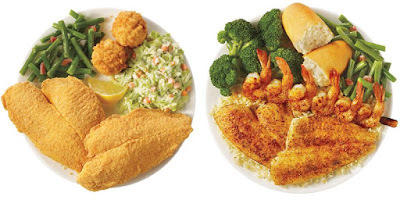 The meal includes Baked Cod, two sides and cornbread for $8.49. - Carl's Jr. / Hardee's - Red Hook Beer Battered Fish sandwich is back. - Checkers / Rally's - They regularly offer the Deep Sea Double and Crispy Fish Sandwich. - Church's Chicken - $5 Pick Your Seafood Platter - Choose either: Butterfly Shrimp, new Shrimp 'n' Tenders (i.e. shrimp and chicken tenders), or Crispy Fish to go with two sides and a biscuit for $5. - Del Taco - Jumbo Shrimp is back and can be found in tacos as well as two burritos. You can get two Jumbo Shrimp Tacos for $5. They also have Beer Battered Fish Tacos at two for $4. - El Pollo Loco - Baja Shrimp is featured in four new dishes (details). - Jack in the Box - The Fish Sandwich is back. - Long John Silver's - They have a $1.99 Fish & Pups deal where you can get fried fish and hushpuppies on the cheap. - McDonald's - Buy one Filet-O-Fish, get one free offer on their mobile app. Some locations also have a Friday special on the fish sandwiches. - Panda Express - They have Honey Walnut Shrimp on the regular menu. - Quiznos - Lobster & Seafood is back and can be ordered in a sub, bake, or salad. (details). - Subway - They have a Tuna sub on the regular menu. Some locations offer the Seafood Sensation sub. - White Castle - Seafood Crab Cake Slider and Shrimp Nibblers are back (details). They also serve Clam Strips, Fish Nibblers, and Fish Sliders. - Yoshinoya - New Lobster Stew (details).